Belgian Congo Birds Bird stamps from Belgian Congo. The Belgian Congo was the formal title of present-day Democratic Republic of the Congo (DRC) between King Leopold II's formal relinquishment of his personal control over the state to Belgium on 15 November 1908, and Congolese independence on 30 June 1960. The rebellion that had started in Thyssville in the Bas-Congo in July 1960 quickly spread to the rest of the Congo. In September 1960, President Kasa-Vubu declared prime minister Lumumba deposed from his functions and vice versa. The stalemate was ended with the arrest of Lumumba. In January 1961, he was flown to the rich mining province of Katanga, which by that time had declared a secession from Léopoldville under the leadership of Moïse Tshombe (with active Belgian support). Patrice Lumumba was brutally murdered (in 2002 Belgium officially apologised for its role in the elimination of Lumumba; the CIA too has been suspected of complicity). A series of rebellions and separatist movements seemed to shatter the dream of a unitary Congolese state at its birth. Although independent, Belgian paratroopers intervened in the Congo on various occasions to protect and evacuate fellow citizens. The United Nations maintained a large peace-keeping operation in the Congo from late 1960 onward. The situation stabilised only in 1964–65, with the re-integration of the Katanga province and the end of the so-called Simba Rebellion in Stanleyville (province Orientale). Shortly after that army colonel Joseph Désiré Mobutu ended the political impasse by seizing power himself. Mobutu enjoyed the support of the West, and in particular of the United States, because of his strong anti-communist stance. Initially his rule favoured consolidation and economic development (e.g. by building the Inga-dam that had been planned in the 1950s). In order to distance himself from the previous colonial regime, he launched a campaign of Congolese "authenticity". As a result the colonial place names were abandoned in 1966: Léopoldville became Kinshasa, Elisabethville Lubumbashi, Stanleyville Kisangani. 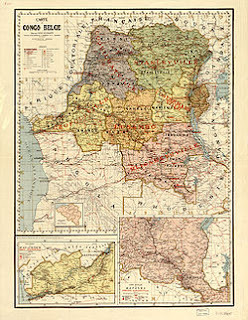 During this period, the Congo maintained close economic and political ties with Belgium, although these were occasionally overshadowed by the financial issues that had remained unresolved after independence (the so-called "contentieux"), for instance the transfer of shares in the big mining companies that had been held directly by the colonial state. In 1970, on the occasion of the tenth anniversary of independence, King Baudouin paid an official state visit to the Congo. Mobutu's regime radicalised during the 1970s. The 'Mouvement populaire de la Révolution' (MPR), of which Mobutu was the président-fondateur, firmly established one-party rule. Political repression increased considerably. Mobutu now renamed the Congo into the republic of Zaïre. The so-called "zaïrisation" of economic life in the mid-1970s led to an exodus of foreign workers and an unmitigated economic disaster. In the 1980s the Mobutu regime became a byword for mismanagement and corruption. Relations with the former colonial power Belgium went through a series of ups and downs, reflecting a steady decline in the underlying economic, financial and political interests. After the end of the Cold War, Mobutu lost support in the West. As a result, in 1990, he decided to end the one-party system and dramatically announced a return to democracy, but subsequently dragged his feet and played out his opponents against one another to gain time. A bloody intervention of the Zaïrian Army against students on the Lubumbashi University Campus in May 1990 precipitated a break in diplomatic relations between Belgium and Zaïre. Pointedly, Mobutu was not invited to attend the funeral of King Baudouin in 1993, which he considered a grave personal affront. Finally, in 1997 Mobutu was chased from power by a rebel force headed by Laurent-Désiré Kabila, who declared himself president and renamed Zaïre into the Democratic Republic of the Congo. Assassinated in 2001, Laurent-Désiré Kabila was succeeded by his son Joseph Kabila, who in 2006 was confirmed as president through the first nation-wide free elections in the Congo since 1960. On 30 June - 2 July 2010, King Albert II of the Belgians and Yves Leterme, the Belgian Prime Minister, visited Kinshasa to attend the festivities marking the 50th anniversary of Congolese independence from Belgium. Certain practices and traditions from the colonial period have survived into the independent Congolese state, such as a strong centralising and bureaucratic tendency, or the organisational structure of the education system and the judiciary. The influence of the Congo on Belgium has manifested itself mainly in economic terms: through the activities of the Union Minière (now Umicore), the development of a nonferrous metal industry, and the development of the Antwerp harbour and diamond industry. To this day, Brussels Airlines (successor of the former Sabena) has maintained a strong presence in the DRC. It is estimated that there currently (2010) remain more than 4,000 Belgians resident in the DRC, while the Congolese community in Belgium is at least 16,000 strong. The "Matonge" quarter in Brussels (Porte de Namur) is the traditional meeting point of the Congolese community in Belgium.